This Swift 4.2 course is based on our in-person app development bootcamp in London, where we’ve perfected the curriculum over 3 years of in-person teaching. I’ll take you step-by-step through engaging and fun video tutorials and teach you everything you need to know to succeed as an iOS app developer. It’s updated to include over 7 hours of content on Apple’s brand new ARKit 2 for making Augmented Reality apps as well as CoreML2 & CreateML for making intelligent apps with Machine Learning. You’ll be building your own machine learning models that use Artificial Intelligence to recognise images and emotions in tweets. You’ll also be building 3D augmented reality apps that look like Pokemon Go and Harry Potter’s magical newspapers! You’ll also have a portfolio of over 25 apps that you can show off to any potential employer. Over 50 hours of HD 1080p video content, everything you’ll ever need to succeed as a iOS developer. We know that you’re here because you value your time. If you wanted to watch someone program for hours and hours without explaining what they’re doing, you’d be on YouTube. By getting this course, you can be rest assured that the course is carefully thought out and edited. There are beautiful animations that explain all the difficult concepts and we’re always on hand to answer student questions. Persistent Local Data Storage: How to use Core Data, Realm, Codable and User Defaults to store your app data locally. Machine Learning: How to make artificially intelligent apps and build your own machine learning models using iOS 12’s new CoreML2 and CreateML frameworks. Augmented Reality: How to create 3D objects in augmented reality and create incredible 3D animations and real-life interactions using Apple’s latest ARKit2 framework. Don’t waste another minute of your precious life on poor quality videos on YouTube. Or instructors who you can’t understand. Or teachers who have no real world in-person teaching experience. Your time is precious. Take this course and find out why everybody is raving about it and why over 18,000 students rated it 5 stars! Inside this course, you’re getting exactly the same course materials and curriculum as our 12 week in-person programming bootcamp. Instead of spending $8000 dollars and taking time off work, save loads of money by getting this course and do it at your own pace! REMEMBER… I’m so confident that you’ll love this course that we’re offering a FULL money back guarantee for 30 days! So it’s a complete no-brainer, sign up today with ZERO risk and EVERYTHING to gain. So what are you waiting for? Click the buy now button and join the world’s most highly rated iOS 12 app development course. 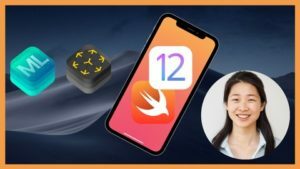 If you are a seasoned programmer, then take this course to to get up to speed quickly with Swift 4.2 and native app development. Start with the Xcode walkthrough lesson and we’ll get you familiar with iOS development in no time! If you are switching from Objective-C to Swift then this is a fast-track way of doing it. You can get started straight away with the Intermediate Swift Language module. If you are a pro iOS developer and want to quickly get up to date with Apple’s new iOS 12 APIs, then start with the modules on ARKit2 and CoreML2.